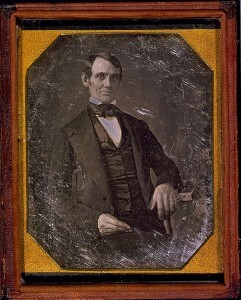 This, the earliest known image of Abraham Lincoln, was taken around 1847 and is from the collection of the Library of Congress. One of the least known of Henry Clay’s accomplishments is the influence he had on a young native Kentuckian, transplanted to Illinois. The young Kentuckian, who himself sought a career in politics, was none other than Abraham Lincoln. Lincoln once told a sculptor carving his likeness that he “almost worshiped Henry Clay.” Although Lincoln is not known to have ever met Henry Clay, there can be little doubt of the profound impact Clay had on him. For Lincoln, Henry Clay was his “beau ideal of a statesman,” a political role model to be emulated and supported. Lincoln cast his first presidential vote for Clay in 1832. In 1844, Lincoln campaigned vigorously for Clay and served as an elector for him in the State of Illinois. Lincoln, as a member of the Springfield Clay Club, signed an invitation which was extended to Clay to speak in Springfield during his 1844 presidential campaign. In 1847, Abraham and Mary Todd Lincoln stopped in Lexington on their way to Washington D.C.. Lincoln was to assume the seat to which he had been elected in the US House of Representatives. While in Lexington, Lincoln heard Clay deliver a speech on November 13, 1847 at the Market House. Read the 1847 Market Speech. On July 6, 1852, at the Statehouse in Springfield, Lincoln delivered a stirring eulogy of his political idol, Henry Clay of Kentucky. Abraham Lincoln’s Eulogy of Henry Clay. This quote from The Life and Speeches of Henry Clay was marked by Abraham Lincoln for use in speeches. This is one of many such examples. When Lincoln himself entered the political arena, he did so largely on a platform borrowed from Henry Clay. Lincoln often quoted Clay in speeches in order to reinforce his own ideas or, at times, even in place of them. In the great debates with Stephen Douglas, Lincoln quoted Clay no fewer than 41 times. When Lincoln was elected president, he selected a published edition of a speech Henry Clay gave in support of the Compromise of 1850, as one of four books to keep with him during the writing of his first inaugural address. In 1862, Lincoln appointed Henry Clay’s son Thomas to the posts of Minister to Nicaragua and ultimately to Honduras for little more reason than that he was Henry Clay’s son. In 1864, Henry Clay’s son John sent Lincoln a snuff box owned by his father. Lincoln wrote back. “I recognize his (Clay’s) voice, speaking as it ever spoke, for the Union, the Constitution, and the freedom of Mankind.” Clearly Henry Clay’s voice provided guidance for President Lincoln as he led his country through its darkest hour. This inscription reads”To Abraham Lincoln with constant regard to friendship H. Clay 11may 1847″. This artifact is a recent addition to the collection, having been acquired in the last few years. It was a truly dramtic find as it has caused us to revisit the Clay/Lincoln relationship and to consider a different view of it . 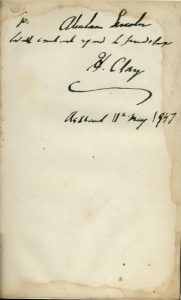 This book is inscribed on the flyleaf “To Abraham Lincoln: With constant regard to friendship H. Clay Ashland 11 May 1847”. This volume of the life and speeches of Henry Clay was evidently a gift from Clay to Abraham Lincoln. At present, there is no information on why the gift was given or the response it elicited from Lincoln. All we currently know is what is evident in the inscription. In view of the book we must now further consider the relationship of Clay and Lincoln and its nature. What previously appeared as a realtively distant idolization by Lincoln now seems perhaps to have been more intimate and even rising to some level of friendship. Hopefully further research will reveal the full story to this amazing find. It may be seen every day on tour at Ashland in the Library.